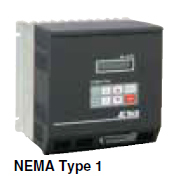 MCH series full feature drive for HVAC professionals in NEMA 1 enclosure for maximum 15HP 3-phase motor. Accepts 208-240V three phase input. For centrifugal loads found in fan, pump and cooling tower applications. SCF series full feature sub-micro drive for use with maximum 10HP 3-phase motor. Accepts 208-240V 3-phase input. Features modbus communication, variable speed, soft start, overload protection and much more. SMVector drive for use with maximum 5HP 3-phase motor. Accepts 208-240V three phase input. With digital keypad in a NEMA 4X indoor enclosure featuring on/off, forward/reverse, speed control, overload protection and much more. 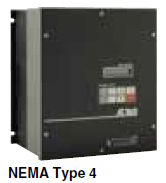 SMVector drive for use with maximum 30HP 3-phase motor. Accepts 400-480V 3-phase input. With integrated line filter & disconnect in a NEMA 4X indoor enclosure featuring speed control, overload protection and much more. MC series full feature micro drive for use with maximum 0.5HP 3-phase motor. Accepts 208-240V three phase input. For indusrial applications in NEMA 4 watertight enclosure featuring digital keypad, variable speed, overload protection and much more. SMVector inverter drive for use with max. 1.5HP 3-phase motor. Accepts 120V or 240V single phase input. With digital keypad in a NEMA 1 enclosure featuring on/off, forward/reverse, speed control, overload protection and much more.